Session #4—Ship Overhaul Pro- cess, Claremont Room. Planning Yards," by Larry R.
Surface Combatants," by J. Birin- delli and A.R. Boerum. Session #5—Process Improve- ment, Brandon Room. R. Helliwell, F. Rogers, and R.
VII in the frozen Beaufort Sea in the dead of winter. The Deutz engines were hauled overland to the highway's end, then trucked on the same flatbed trailer across 200 miles of ice to man- made McKinley Island at 140° W, 70° N, in record time. The Deutz team was on hand to supervise all phases of shipment, receipt, and installation. Deutz 628s under our engineer's supervision. No repowering challenge is too chilling for Deutz! More than 80,000 vessels do. Deutz is represented in all 50 states and 10 provinces. 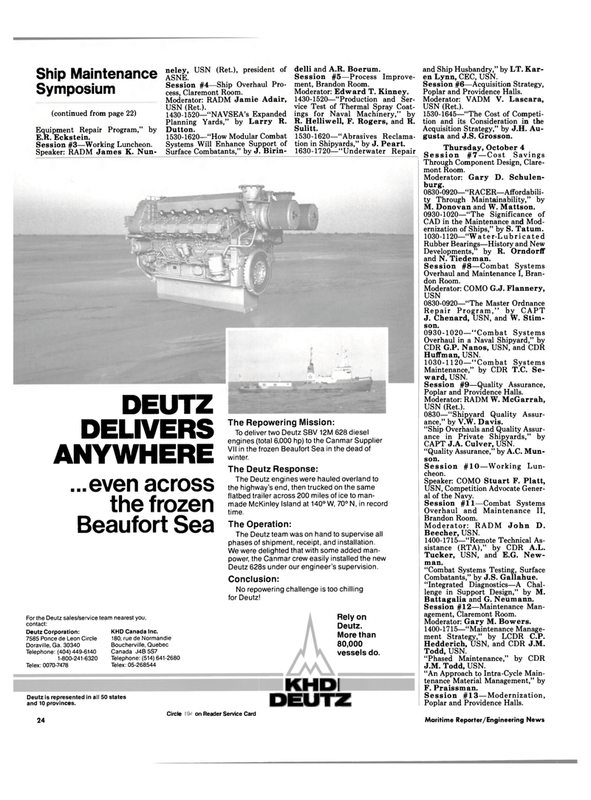 KHDI DEUTZ and Ship Husbandry," by LT. Kar- en Lynn, CEC, USN. Acquisition Strategy," by J.H. Au- gusta and J.S. Grosson. Through Component Design, Clare- mont Room. Developments," by R. OrndorfF and N. Tiedeman. Overhaul and Maintenance I, Bran- don Room. Maintenance," by CDR T.C. Se- ward, USN. CAPT J.A. Culver, USN. "Quality Assurance," by A.C. Mun- son. USN, Competition Advocate Gener- al of the Navy. Beecher, USN. 1400-1715—"Remote Technical As- sistance (RTA)," by CDR A.L. Combatants," by J.S. Gallahue. "Integrated Diagnostics—A Chal- lenge in Support Design," by M.
Session #12—Maintenance Man- agement, Claremont Room. Moderator: Gary M. Bowers. 1400-1715—"Maintenance Manage- ment Strategy," by LCDR C.P. Hedderich, USN, and CDR J.M.